A Vietnam Coast Guard ship tries to move away from a Chinese vessel near China's illegal drilling rig HD 981 in the East Vietnam Sea in this handout photo taken on May 13, 2014 by the Vietnam Coast Guard. A Chinese missile frigate was dispatched on Tuesday to prevent Vietnamese ships from coming closer to Chinese-run oil rig Haiyang 981 illegally planted in Vietnam’s waters since early this month, a Vietnamese marine official has confirmed. “The situation in the East Vietnam Sea is increasingly tense,” Nguyen Ngoc Oai, head of the Vietnam Fisheries Surveillance Force, told local media at a press conference held in Hanoi on May 13. “China has deployed a missile frigate to obstruct our civilian ships,” the official affirmed. Meanwhile, a Tuoi Tre (Youth) newspaper correspondent at the scene reported that Chinese missile frigate #571 on Tuesday moved for the first time from a site close to the drilling rig to approach and threaten Vietnam Coast Guard ships, tasked with requesting the Chinese side to leave the waters, some nautical miles away. In a separate incident, a Vietnam Coast Guard ship was intentionally crashed into by Chinese ships #3411 and #3210 at about 4:00 pm the same day when it was cruising at a location about seven nautical miles from the rig, the reporter added. Also on Tuesday, China deployed more than 32 ships to make a shield to guard the platform and prevent Vietnamese ships from accessing that site, a reliable source at the scene told Tuoi Tre. The source said each Vietnamese ship was closely dogged by six Chinese vessels on average at that time. According to the same source, when Chinese vessels prepared to fire water cannons at Vietnam Coast Guard ships, the Vietnamese side used loudspeakers to say “China has violated Vietnam’s sea sovereignty” in Vietnamese, Chinese, and English. In return, the Chinese responded solely in Chinese and honked their horns tumultuously. The Vietnamese ships have been ordered to avoid possible clashes with or attacks from the Chinese vessels. In related incidents, Vietnam Coast Guard officials were quoted by Tuoi Tre as saying that China on Tuesday sent up to 86 ships, including two military vessels, to guard its oil rig despite strong protests from Vietnam. The officials said CSB 4032, a Vietnam Coast Guard ship, was besieged by three Chinese ships at around 8:30 am that day before having its left side rammed by one of the trio. 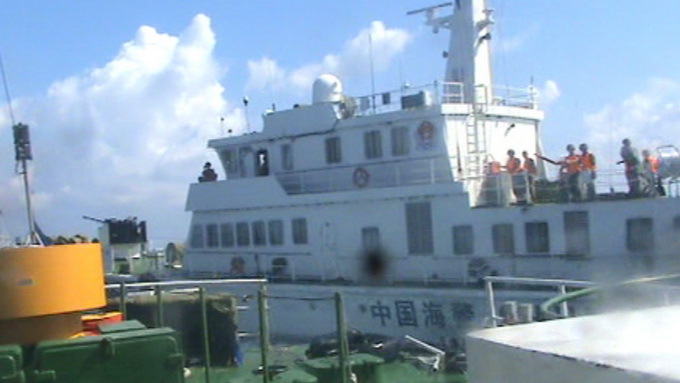 The crash damaged three ventilation fans of the Vietnamese ship and broke a 10m-long part of its railing. In the meantime, Chinese vessels also blasted Vietnam Fisheries Surveillance Force ship #628 with water cannons at a location 5.3 nautical miles from the rig, the officials added. Many Chinese vessels have besieged, purposefully crashed into, and fired high-power water cannons at Vietnamese ships since May 1 when China illegitimately placed the drilling rig in Vietnam’s waters. The rig is located at 15°29’58’’ North latitude and 111°12’06’’ East longitude in the East Vietnam Sea, within the Southeast Asian country’s exclusive economic zone and continental shelf, as the drilling platform lies about 119 nautical miles (221 km) from Ly Son Island off the central Vietnamese province of Quang Ngai and 18 nautical miles south of Tri Ton Island of its Hoang Sa (Paracel) archipelago.